1. When we listen to the voices of those advocating concern for the environment, care for the planet, or care for the quality of human life, we hear certain themes recurring. We find these themes whether the promoters of these concerns are Christians (viewing the universe as a creation with a plan and providence within it) or theists (who see ecological con­cern as somehow a sacred activity) or people who ignore the sacred dimension as if it were irrelevant. A. *The importance of recognising that humans can act constructively or destructively in the way we live. B. *The importance of recycling: we must not behave as if anything can simply be used and thrown away as waste; we must see every object as having its own value. C.*That we must recognise that everything we do as individuals or small groups becomes part of a larger pattern that can have far greater consequences. D.*We must keep our eyes fixed on the longer-term picture: ‘Now’, ‘Today’ are such fleeing moments! For the last gospel of the church’s year we return to John and this scene from the trial of Jesus before Pilate. Pilate represents the most powerful empire the world has ever known and lives out of a world view that is utterly contrary to that espoused by Jesus. 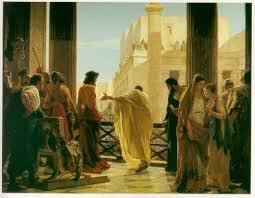 For Pilate, kings and kingship mean only one thing: a threat to the established order. For Jesus this is the language of the Bible where God is the shepherd king who looks out for the lost and bandages the wounded. For the worldly governor of Judea this is all a pipe dream; for Jesus it is a vision that will en­dure long after the Roman Empire has crumbled into the dust By his death and resurrection Jesus has witnessed to the truth about God and those who search for the truth still listen to his voice. We don’t know how many people witnessed the death of Jesus in Jerusalem. We know that some of those who did were delighted to have him out of the way at last. Others were heartbroken at the death of a truly good man and the shattering into pieces of a dream for something better, a new world order in which love and service would triumph over oppression and hatred. The majority probably just went about their business and reflected that really it is wiser just to keep your head down and say nothing. We can be sure that nobody there thought they were wit­nessing the death of Christ the Universal King. His kind of king-ship has to be learned and not in palaces nor in schools of diplo­macy but among the poor and needy and those whom the world has forgotten. For our king is the servant of the poor and we only belong to his court when we do likewise. A big thing in life is ‘where are you from’? We say ‘your accent betrays you’. Sometimes we judge totally on where people are from, as Pilate with Jesus. With all he knew of him and heard, the miracles and the speeches – where are you from? Are you a king really? What sort is your kingdom? Pilate was intrigued with Jesus and so are we. Our role in life, our vocation and our mission is a calling to live like him in love and service. There is the ‘from above’ in Jesus and much of John’s gospel stresses the divinity of Christ. He doesn’t look very divine but he does look very human. In the human is the divine. So we could be like him. We become like him by reading about his life and living like he did. He is a king in his truth, justice, compassion and love. The king-defender of the poor. #2: “Long live Christ the King!” In the 1920s, a totalitarian regime gained control of Mexico and tried to suppress the Church. To resist the regime, many Christians took up the cry, “Viva Cristo Rey!” (“Long live Christ the King!”) They called themselves “Cristeros.” The most famous Cristero was a young Jesuit priest named Padre Miguel Pro. Using various disguises, Padre Pro ministered to the people of Mexico City. Finally, the government arrested him and sentenced him to public execution on November 23, 1927. The president of Mexico (Plutarco Calles) thought that Padre Pro would beg for mercy, so he invited the press to the execution. Padre Pro did not plead for his life, but instead knelt holding a crucifix. 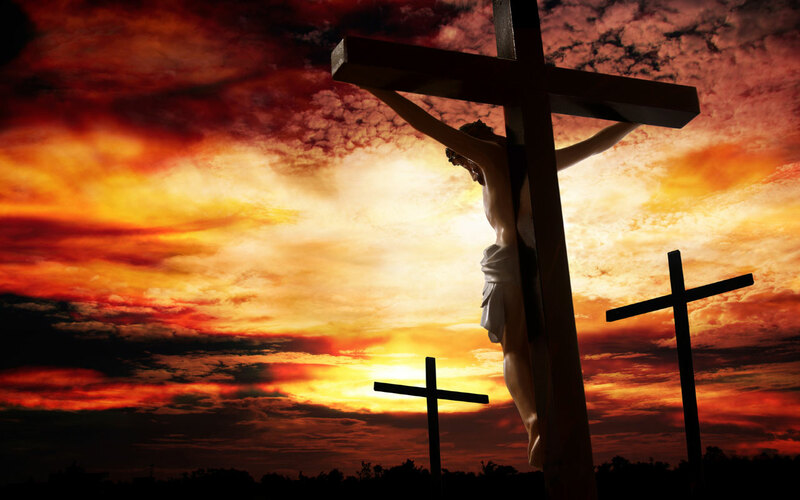 When he finished his prayer, he kissed the crucifix and stood up. Holding the crucifix in his right hand, he extended his arms and shouted, “Viva Cristo Rey!” (“Long live Christ the King!”) At that moment the soldiers fired. The journalists took pictures; if you look up “Padre Pro” or “Saint Miguel Pro” on the Internet, you can see that picture. (Fr. Phil Bloom). #3: “I die the king’s good servant, but God’s first.” St. Thomas More is the patron saint of lawyers and politicians, among others. He was a brilliant lawyer and diplomat in 16th century England. His patriotism and loyalty to the throne attracted the attention of King Henry VIII who made him Lord Chancellor of England. What Henry VIII did not know was that Thomas More’s first loyalty was to Christ, the King of kings. When Henry VIII decided to divorce his wife Catherine of Aragon, marry Anne Boleyn and make himself head of the Church of England, More thought this was not right. Rather than approve what he believed to be against the Divine will, he resigned from his prestigious and wealthy position as Lord Chancellor and lived a life of poverty. Since he would not give his support to the king, Thomas More was arrested, convicted of treason, imprisoned in the Tower of London in 1534 and beheaded in July of the following year. On his way to public execution, More encouraged the people to remain steadfast in the Faith. His last recorded words were: “I die the king’s good servant, but God’s first.” For More, it was not simply enough to confess Christ privately in the safety of his heart and home; he believed one must also confess Christ in one’s business and professional life as well as in the laws and policies that govern society. (Fr. Munacci). 1) A Man for All Seasons: There is a great scene in the play, A Man for All Seasons, that fits very well with today’s Feast of Christ the King. You might remember that the play was about the determination of St. Thomas More to stand for the Faith against the persuasion and eventually the persecution of Henry VIII of England. In the scene I’m referring to, Henry VIII is trying to coax his second-in-charge, Thomas More, to agree with him that it is proper for him, the King, to divorce his wife Catherine on the grounds that she was also his sister-in-law but really because she had not given birth to a male heir to the Kingdom. After the King made all his arguments, Thomas More said that he himself was unfit to meddle in this argument and the King should take it to Rome. Henry VIII retorted that he didn’t need a Pope to tell him what he could or couldn’t do. Then we come to the center point. Thomas More asked the King, “Why do you need my support?” Henry VIII replied with words we would all love to hear said about each of us, “Because, Thomas, you are honest. And what is more to the point, you are known to be honest. There are plenty in the Kingdom who support me, but some do so only out of fear and others only out of what they can get for their support. But you are different. And people know it. That is why I need your support.” In the presence of integrity, Henry VIII knew who was King and who was subject. 5) Francis of Assisi was wealthy, high-born and high-spirited, but he was not happy. He felt that life was incomplete. Then one day he was riding, and he met a leper, loathsome and repulsive in the ugliness of his disease. Something moved Francis to dismount and fling his arms around this wretched sufferer; and, lo, in his arms the face of the leper changed to the face of the Christ. 7)”Long Live Christ the King! Long Live the Pope.” Those of us, who pray for the persecuted Church, mourned the loss of Ignatius, Cardinal Kung who died at the age of 98. He stood by his convictions, and withstood persecution for his Faith. He was consecrated the bishop of Shanghai in 1949, shortly after the Communists took over China. The Chinese government pressured him to align his loyalties to the “Chinese Catholic Patriotic Association.” But he refused, choosing to remain loyal to his Church’s chain of command. In 1955, the authorities brought him and 200 other priests to a stadium in Shanghai. The government ordered them to “confess their crimes.” Instead, Kung shouted “Long Live Christ the King! Long Live the Pope.” Shortly thereafter, he received a life sentence, where he spent the next 30 years in prison, most of the time in solitary confinement. When he was freed in 1987, he came to the United States with his nephew and settled in Stamford, Connecticut. He went to his eternal reward on March 12, 2000. 10) “Honey, take a long, long look”: As the body of Abraham Lincoln’s body lay in state for a few hours in Cleveland, Ohio for mourners to pay their tribute, a black woman in the long queue lifted up her little son and said in a hushed voice: “Honey, take a long, long look. He died for us, to give us freedom from slavery.” Today’s Gospel gives us the same advice, presenting the trial scene of Christ our King who redeemed us from Satan’s slavery by His death on the cross. 12) The Generals of Insignificance in our lives: In the Berlin Art Gallery there is a painting by the famous artist Adolph von Menzel that is only partially finished. It is called, “Frederick the Great Addresses His Generals before the Battle of Leuthen in 1757.” Menzel painstakingly painted the generals first, placing them around the outside of the painting as a background and leaving a bare patch in the middle of the painting for the King. But Menzel died before he could finish the painting. So there is a painting full of generals but no king. We often spend much time enthroning the generals of insignificance in our lives and postpone inviting Jesus the King of Kings into our hearts till the last moment which is quite uncertain. As a result, many Christians die without putting Christ into the very center of their lives. The painting of our lives will never be complete until we place at its center Christ the King whose feast we celebrate today. 13) “I shall be that soldier.” Sportsman and best-selling author Pat Williams, in his book The Paradox of Power, tells about one man who deserved to bear the name Christian. In fact, that was his name — Christian X – who was King of Denmark during World War II. The people of Denmark remember him the way any of us would want to be remembered, as a person of character, courage, and principle. Every morning, King Christian rode without bodyguards in an open carriage through the streets of Copenhagen. He trusted his people and wanted them to feel free to come up to him, greet him, and shake his hand. In 1940, Nazi Germany invaded Denmark. Like so many other European nations, this small Scandinavian country was quickly conquered. But the spirit of the Danish people and their king proved unquenchable. Even after the Nazis had taken control of the nation, King Christian X continued his morning carriage rides. He boldly led his people in a quiet but courageous resistance movement. On one occasion, the king noticed a Nazi flag flying over a public building in Copenhagen. He went to the German Kommandant and asked that the flag be removed. “The flag flies,” the Kommandant replied, “because I ordered it flown. Request denied.” “I demand that it come down,” said the king. “If you do not have it removed, a Danish soldier will go and remove it.” “Then he will be shot,” said the Kommandant. “I don’t think so,” said King Christian, “for I shall be that soldier.” The flag was removed. 14) Jesse Owens crushing Hitler’s Aryan Supremacy theory: The black man standing in the arena was an affront to Der Fuehrer’s authority. The scene was the 1936 Olympic Games held in Berlin, Germany. The black man was Jesse Owens of The Ohio State University representing the U.S.A. He was aptly called “the fastest human alive.” Der Fuehrer was Chancellor Adolf Hitler who had recently risen to power championing an arrogant theory that his “Aryan race” of “supermen” would conquer the world. In implementing his theory, he began systematically to stamp out the Jews in a bitter expression of prejudice and discrimination. Hitler also publicly denounced Blacks (Negroes as they were called then), as an inferior race. Jesse Owens, in his estimation, should not even be present at the Games. Jesse Owens was not only present, but he went on to win four gold medals in the 100-meter-dash, the 200-meter-dash, the broad jump and the 400-meter relay race. He demolished Hitler’s claim that the Aryan race was superior to all others. Furthermore, this soft-spoken black athlete embarrassed Hitler and undermined his pompous authority in the heart of the Fatherland. Today is Christ the King Sunday in the liturgical calendar, an appropriate time for us to grapple with the whole question of authority. We may not be in danger of being seduced by an evil power such as Hitler, but we may not be clear on the authority to whom we give allegiance. 15) Faith in and fidelity to the King: While battling the Philistines, King David was camped at a place called the Cave of Adullam. He was tired of fighting and was longing for a taste of home. David said, wishing out loud, “O that someone would give me water to drink from the well of Bethlehem which is by the gate!” Three of his most able and faithful soldiers overheard the king, and took it upon themselves to go and get water from that well for him. It meant risking their necks, for they had to break through the camp of the Philistines to do it. When they brought the water to David, however, he refused to drink it. He recognized how dangerous it had been to get the water, and he realized that this act showed how highly they regarded him. Instead of drinking it, he poured it out on the ground as an offering to the Lord. David had already shown his faith in his men, and these three were responding with faith and love for their king. (1 Chronicles 11:15-19). What about Christ? Does he inspire Faith in you? 16) In the Line of Fire. Dr. Gary Nicolosi compares God’s love to the 1993 hit film, In the Line of Fire. Clint Eastwood plays Secret Service agent Frank Horrigan. Horrigan had protected the life of the President for more than three decades, but he was haunted by the memory of what had happened thirty years before. Horrigan was a young agent assigned to President Kennedy on that fateful November day in Dallas in 1963. When the assassin fired, Horrigan froze in shock. For thirty years afterward, he wrestled with the ultimate question for a Secret Service agent: Can I take a bullet for the President? In the climax of the movie, Horrigan does what he had been unable to do earlier: he throws himself into the path of an assassin’s bullet to save the President. Secret Service agents are willing to do such a thing because they believe the President is so valuable to our country that he is worth dying for. At Calvary the situation was reversed, says Dr. Nicolosi. The President of the Universe actually took a bullet for each of us. 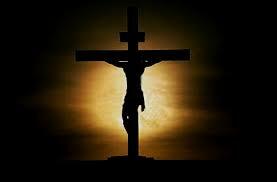 At the cross we see how valuable we are to God. 17) The shivering and hungry King: This is a story about an Irish King. He had no children to succeed him on the throne, so he decided to choose his successor from among the people. The only condition set by the King, as announced throughout his kingdom, was that the candidate must have a deep love for God and neighbor. In a remote village of the kingdom lived a poor but gentle youth who was noted for his kindness and helpfulness to all his neighbors. The villagers encouraged him to enter the contest for kingship. They took up a collection for him so that he could make the long journey to the royal palace. After giving him the necessary food and a good overcoat, they sent him on his way. As the young man neared the castle, he noticed a beggar sitting on a bench in the royal park, wearing torn clothes. He was shivering in the cold while begging for food. Moved with compassion, the young man gave the beggar his new overcoat and the food he had saved for his return journey. After waiting for a long time in the parlor of the royal palace, the youth was admitted for an interview with the king. As he raised his eyes after prostrating before the king, he was amazed to find the King wearing the overcoat he had given to the beggar at the park and greeting him as the new King of the country. When He comes in glory, Christ the King is going to judge us on the basis of our corporal and spiritual works of mercy. 19) Gluttonous kings versus humble king: Hu Hai was the second emperor of the Qin Dynasty (221 BC-206 BC). Hu Hai indulged in the super luxurious life. He forced a large number of peasants from around the country to build Epang Palace and the mausoleum in Lishan Mountain. He ordered 50,000 soldiers to defend the capital and all parts of the country were forced ceaselessly to send provisions to the capital. Several of the Roman emperors, unmatched in wealth and power, fully demonstrated a capacity for luxury and gluttony. Among these emperors, Claudius (ruled AD 41–54) is famous. The luxury banquet laid out in the famous tomb of King Tutankhamen of Egypt (died 1352 BC. ), which was intended for the monarch to enjoy in the afterlife, included a gourmet selection of wines inscribed with names of wine districts— one may call them— the Nile Valley, the Nile Delta, and the Oases. Hundreds of attendants waited on them. Against this background, there came a King, giving a shocking surprise to his followers. Jesus washed the feet of his followers and waited on them. He performed a gesture that had never been heard of, and commanded his followers to do the same, and to follow it as a new commandment in his Kingdom. (Fr. Bobby Jose). 20) Large grave in the monastery: St. Theodosius was a monk who lived in Palestine in the 500s. After growing in holiness himself, he decided to start a new monastery, which soon attracted so many vocations that it became more of a monastic city than just a monastery. One of the first things he did when he founded his monastery was rather shocking. He dug a large grave, right in the middle of the cloister. When he had finished digging, the little group of curious monks gathered around the rectangular pit to get an explanation. Theodosius said simply: “Here you see a grave. Here we will all one day be buried and our bodies will return to the dust from which they were made. Remember this, my sons, so that you never stray from the Lord’s sure but narrow road of prayer and self-denial. It is better to die to ourselves each day and rise again on the Day of Judgment than indulge ourselves foolishly now and remain in the grave forever.” St Theodosius had learned well the lesson of today’s parable – Christ wants us to know what’s going to happen after death, so that we can make the right choices throughout our life. (E-Priest). 22) Hilaire Belloc won the election: In 1908, the famous Anglo-French historian and writer, Hilaire Belloc [BELL-ock] ran for the British Parliament. His opponents tried to scare off his supporters by claiming that Belloc’s faithfulness to the Catholic Church would inhibit him from being objective. Belloc responded in a speech: “Gentlemen, I am a Catholic. As far as possible, I go to Mass every day. This [taking his beads out of his pocket] is a rosary. As far as possible, I kneel down and tell its beads every day. If you reject me on account of my religion, I shall thank God for having spared me the indignity of being your representative.” The crowd was shocked for a minute, and then burst out in applause. Belloc went on to win that election, and many more. If Catholics cannot bring Christ’s wisdom, goodness, and grace into our society, what do we have to offer? Our paltry human wisdom? Our own tendencies to selfishness? Our shortsightedness? 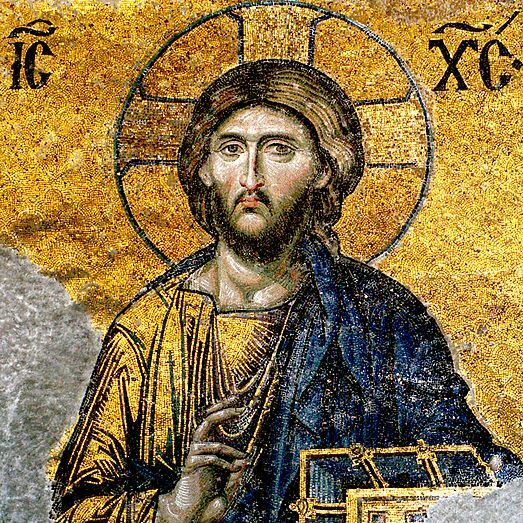 Pope Pius XI’s encyclical stresses that Christ truly is the King of the Universe, that He will reign forever, and that the Church on earth is the beginning of His Kingdom. It is not enough, therefore, for Christians to hold onto their Faith just in their private lives. We must bring Christ and Christian values into culture, politics, and every sphere of society. If we truly believe in Christ, why would we be afraid of defending and spreading Christian values? Why would we let ourselves be bullied by secular fundamentalists who try to exclude Christ from culture? (E- Priest). 23) The Obelisk in St Peter’s Square: In St Peter’s Square in Rome, there stands an ancient Egyptian obelisk – a single block of granite in the shape of the Washington monument, almost 100 feet high and weighing 330 tons. It is the oldest obelisk in Rome, dating from about 1850 BC. At that time it had been erected as a monument to the Pharaoh, and it watched over two thousand years of Egyptian history – the longest reigning empire in history. It stood there when Abraham was called, when Joseph was viceroy of Egypt, when Moses led his people out of Egypt. At the time of Christ, soon after the Magi came to worship him, the Roman Emperor Caligula brought it to Rome as a sign of Rome’s superiority as conqueror of Egypt. There it stood for four more centuries, a symbol of the Roman Empire, the largest empire in human history. A golden urn with Julius Caesar’s ashes was placed on it. It stood in the arena where St Peter himself was martyred, along with hundreds of other early Christians. Then the barbarians invaded Rome, and in the Middle Ages it fell. Ivy grew around it. It was half-buried near the old Basilica. But the Church converted the barbarians, and when a new Christian culture emerged and flourished, and St. Peter’s Basilica was rebuilt and expanded, Pope Sixtus V had the obelisk re-erected in the center of the plaza. No longer is it a reminder of the long-perished empires of Egypt, Rome and the barbarian hoards. Now it is topped with a bronze cross, and inside that bronze cross is a small fragment of the true cross, the cross on which Christ, conquering his Kingdom, was crucified. Now it serves the universal Kingdom that will have no end, the Kingdom of Jesus Christ. (E- Priest). 24) Empires Come and Go – The Church Endures: St Maximilian Kolbe: This is one of the reasons why tyrants hate the Catholic Church so much. Tyrants want total control – we call their governments “totalitarian regimes“. And so they can’t stand the Catholic Church, because it is a constant reminder that they don’t have total control – that they can’t; only God can. And so, just as Herod tried to do with Jesus, the eternal King, they try to stamp out the Church, the eternal Kingdom. The Roman emperors tried. The barbarian tribes of northern Europe tried. The Medieval Islamic Caliphs tried. The French Revolutionaries tried. Napoleon tried – he even kidnapped the Pope, twice! The Nazis tried, and the Communists tried too, giving the twentieth century the bittersweet honor of having more Christian martyrs than any previous century. The tyrants of every generation try to take over the throne that only Christ can occupy, but the Church continues to survive, grow, and spread. A favorite example of this unconquerability of our Faith is found in St. Maximilian Kolbe. He was the Franciscan priest who died famously in a Nazi concentration camp during World War II. A fellow prisoner had been condemned to death. But the condemned man had a family, and St. Maximilian had none, so the saint offered himself as a substitute. It was the crowning action of a string of selfless deeds that he performed throughout his imprisonment. Even the horrors of that concentration camp couldn’t conquer his Christian spirit. He celebrated secret masses on crowded, plank bunk beds; he secretly heard confessions walking through the mud to work; he even gave hope to his fellow death-row inmates: for fifteen days they prayed and sang hymns in the bunker where they were being starved to death. This is Christ the King’s everlasting, unconquerable, universal Kingdom. This is our Kingdom. This is our Church. (E- Priest). 25) The King of Kings is here!The old Cardinal, Hugh Latimer, often used to preach before King Henry VIII. It was customary for the Court preacher to present the King with something on his birthday, and Cardinal Latimer presented to Henry VIII a pocket handkerchief with this text in the corner –“Whoremongers and adulterers God will judge,” a very suitable text for King Henry. Then he preached very forcefully on the sins of lust, and did not forget the personal application to the King. And the King said that the next time (the next Sunday), when the Cardinal preached he must apologize. The next Sunday, when the Cardinal stood in the pulpit, he thought to himself, “Latimer, be careful about what you say, the King of England is here.” At the same time a voice in his heart said, “Latimer, Latimer, be careful about what you say, the King of Kings is here.” Strengthened by this, he preached what God wanted him to preach. -Today we celebrate the feast of Christ the King. We must enthrone Jesus as our King in our hearts and in our homes. (John Rose in John’s Sunday Homilies). 27) A king of love, mercy and justice: The contemporaries of Jesus grew up hearing the stories of the cruelty of the ancient kings and rulers. Biblical Accounts give vivid descriptions of the cruelty of the Assyrians. In 722 BC Assyrian armies swept through the Near East. They became notorious for their cruelty. There are caves in Palestine to this day where we can find etched into cave-walls depictions of Assyrian cruelty: men beheaded, children disemboweled, pregnant women ripped open. The Assyrians did it. Up until the Assyrian assault there had been twelve tribes in Israel. The Assyrians slew ten. After 722 BC there were only two tribes left, Judah and Benjamin. The other ten will never be seen again. The kings of Assyria tormented the miserable world. They flung away the bodies of soldiers like so much clay; they made pyramids of human heads; they burned cities; they filled populous lands with death and devastation; they reddened broad deserts with carnage of warriors; they scattered whole countries with the corpses of their defenders as with chaff; they impaled ‘heaps of men’ on stakes, and strewed the mountains and choked rivers with dead bones; they cut off the hands of kings and nailed them on the walls, and left their bodies to rot with bears and dogs on the entrance gates of cities; they employed nations of captives in making brick in fetters; they cut down warriors like weeds, or smote them like wild beasts in the forests, and covered pillars with the flayed skins of rival monarchs.” The contemporaries of Jesus also were familiar with the cruelties of the Roman emperors and King Herod. They knew how the kings in the ancient world treated their enemies. Against this background there arose a king with a different code of conduct. Hammurabi, the ancient Babylonian king, created the first written set of laws. Since the laws were clearly written down, everyone was expected to obey them. But Jesus, the king of Kings, summarized all the laws into two and wrote them down in the hearts of men. He taught, “Love God with your whole being and love your neighbors as yourself.” In the ancient world where enemies were treated with great cruelty, and criminals were murdered mercilessly, this was a shocking message. But from this emerged the uniqueness of the Kingdom Jesus. On this code is grounded the power of His kingdom which will last forever. This has made the kingdom of Jesus different from all the kingdoms on the earth. History has seen the rise and fall of many empires. But history has not seen any empire other than the empire of Jesus that grows century after century. When the angel announced to Mary that she had been chosen to be the mother of Jesus, he said, “His kingdom will have no end.”(Lk 1:33) The angel thus conformed the prophecy of Daniel: “His sovereignty is an eternal sovereignty which shall never pass away, nor will his empire ever be destroyed.” (Dan 7:14). Fr. Bobby Jose. 28) Jesus is the king of hearts: Bishop Villegas in his book entitled Jesus In My Heart said that Jesus is king of hearts in every Christian. To explain this contention, Villegas used the image of a deck of cards which carries four images of kings. The first image is the king of clubs. A club is an extension of a violent hand. A club is an extension of a hostile man. Christ cannot be king of clubs because Jesus is not here to sow violence. Jesus is not here to sow hostility. Jesus is here as a king of peace. Jesus is here, gentle and humble of heart, not to sow enmity among us. Jesus is here so that all may be brothers and sisters to one another. Bishop Villegas continued that Jesus could not be king of spades. A spade is used to throw dirt. Jesus is not here to make our lives dirty. Jesus is here to cleanse us from everything that defiles us. Jesus is not the king of spades because Jesus is not in the grave. Jesus is risen from the dead. Jesus is not king of spades because the business of Jesus is not to make other people dirty, to make people look at the grave dug by spades. The business of Jesus is to give hope and purity to us. Jesus cannot be king of diamonds for he came to bless our poverty. Jesus came to bless our pains and our aches. Jesus is not here to make our lives easier and more comfortable. 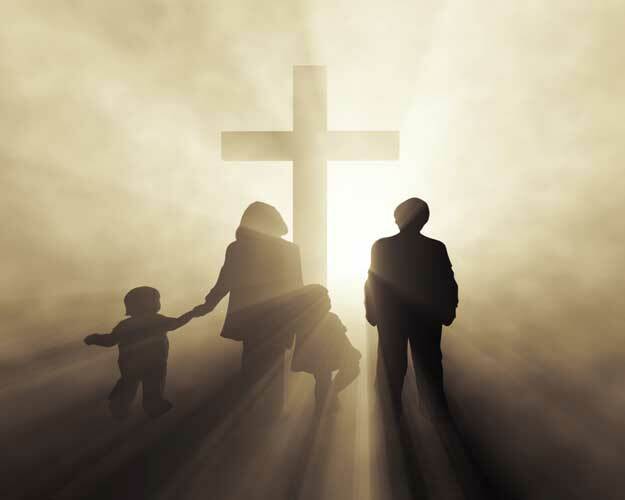 Jesus is here to give meaning and purpose to our crosses and pains and trials. But Jesus can only be king of hearts. This is the kind of king that Jesus is. He is the king of the universe because he is the king of hearts. (Fr. T.S. Benitez). 29) Come unto me: A wonderful statue of Jesus the Christ exists in the cathedral of Denmark’s fairy-tale city of Copenhagen. The sculptor was the master Albert Bertel Thorvaldsen who died in 1844. He chose to sculpt a monumental Christ, the Christus, that would reveal Him in all His majesty. His hands would be raised as befitted His awesome power. His face would look out regally on everyone and everything. He would indeed be the King of kings, the Man in total control. It was done. “Jesus is the greatest figure in human history,” the sculptor said when the clay model was finished, “and this statue will so represent Him.” However, a funny thing happened on the way to the unveiling. The statue was left in a shed near the water. The dampness had its way with the clay Christ statue. The upraised hands had drooped. They no longer commanded. Rather, they beseeched. The fiercely upturned face had lowered itself onto the Master’s chest. The person who wore this face had known many problems and was compassion itself. This was no longer a King before whom one would grovel and stutter, “Your Royal Majesty.” Rather, it was a Shepherd solicitous for every one of His sheep. At first, Thorvaldsen was bitterly disappointed by the accident. Then he realized after reflection that this was a more accurate Jesus than the one he had originally conceived. Indeed, it might have been providentially planned. So, he left it undisturbed. His original intention had been to inscribe the dictum “FOLLOW MY COMMANDS” on the base of the statue. But now he realized that was no longer appropriate. Instead he chiseled the softer message “COME UNTO ME.” To this day, this benign Nazarene touches the hearts and spirits of those who enter the Copenhagen cathedral. It is reported that often Thorvaldsen’s masterpiece reduces spectators to tears. In most probability, it has more of a genuine effect on them than his majestic Christ ever would have. The statue reminds them of His famous words to a puzzled Pontius Pilate in today’s Gospel, “My kingdom is not of this world.” (Father James Gilhooley). 31) King of kings and Lord of lords. Listed in any history book among the greatest leaders that the world has ever known would be the name, Augustus Caesar. It was Augustus Caesar who fixed the limits of the Roman Empire. It was during his reign that the Pax Romana, the peace of Rome that lasted for over 200 years, was initiated. It was Augustus who ordered the building of roads linking the colonies of the great Empire and allowing rapid access to subordinate governments. It was he who gave Rome its constitution, creating the office of Emperor and investing in that office unlimited power, though he never used the title Emperor himself. The age of Augustus was a bright spot in literature and the arts. It was the era that gave the world Virgil, and the great historians. Augustus was truly a great ruler. Is it not ironic, then, that 2000 years after the reign of Augustus Caesar, he is mainly remembered because every year at Christmas time, we read these timeless words: “In those days, a decree went out from Caesar Augustus that all the world should be taxed” (Luke 2:1) Among those to be taxed, of course, were Mary and Joseph from Nazareth. Augustus Caesar would truly be shocked to realize that during his reign was born One who was far greater than he. He was the One Who had been anointed King of Kings and Lord of Lords. It was a minor official in the Roman Empire, Pontius Pilate, who first asked him, “Are you the King of the Jews?” (John 18:33). Jesus obviously convinced him that he was. We often see engraved on crosses the letters INRI. They stand for Iesus Nazarenus Rex Iudaeorum, Jesus the Nazarene, King of the Jews. St. Teresa of Avila, the 16th century Carmelite reformer, always referred to Jesus as “His Majesty,” and so He is. After 2000 years, His stature has not diminished.”( http://stjohngrandbay.org/wt/client/v2/story/WT_Story.cfm?SecKey=151). 32) Cruel, savage kings versus king Jesus Christ: The contemporaries of Jesus grew up hearing the stories of the cruelty of the ancient kings and rulers. Biblical Accounts give vivid descriptions of the cruelty of the Assyrians. In 722 BC Assyrian armies swept through the Near East. They became notorious for their cruelty. There are caves in Palestine to this day where we can find etched into cave-walls depictions of Assyrian cruelty: men beheaded, children disemboweled, pregnant women ripped open. The Assyrians did it. Up until the Assyrian assault there had been twelve tribes in Israel. The Assyrians slew ten. After 722 BCE there were only two tribes left, Judah and Benjamin. The other ten will never be seen again. The kings of Assyria tormented the miserable world. They flung away the bodies of soldiers like so much clay; they made pyramids of human heads; they burned cities; they filled populous lands with death and devastation; they reddened broad deserts with carnage of warriors; they scattered whole countries with the corpses of their defenders as with chaff; they impaled ‘heaps of men’ on stakes, and strewed the mountains and choked rivers with dead bones; they cut off the hands of kings and nailed them on the walls, and left their bodies to rot with bears and dogs on the entrance gates of cities; they employed nations of captives in making brick in fetters; they cut down warriors like weeds, or smote them like wild beasts in the forests, and covered pillars with the flayed skins of rival monarchs.” The contemporaries of Jesus also were familiar with the cruelties of the Roman emperors and King Herod. They knew how the kings in the ancient world treated their enemies. Against this background there arose a king with a different code of conduct. Hammurabi, the ancient Babylonian king, created the first written set of laws. Since the laws were clearly written down, everyone was expected to obey them. But Jesus, the king of Kings summarized all the laws into two and wrote them down in the hearts of men. He taught, “Love others as I have loved you.”(Fr. Bobby Jose).